Nenana Alaska is located at mile 305 of the Parks Highway. This historic community / Athabascan Native Village is 56 miles from Fairbanks and 75 miles north of Denali National Park. This site is Nenana's community web site designed to provide you with links to whereever in Nenana you wish to go, and to introduce you to our community with some basic facts and pictures of life from Nenana's view of the world. Toghotthele Hill is a very visible landmark, and why Nenana, long ago, became a traditional gathering place for hunting, fishing, trade, meetings and celebrations by different groups of Athabascan Indian. The sternwheeler, later the barges, the highway, the train all converged here changing Nenana and making it a melting pot of diverse cultures. 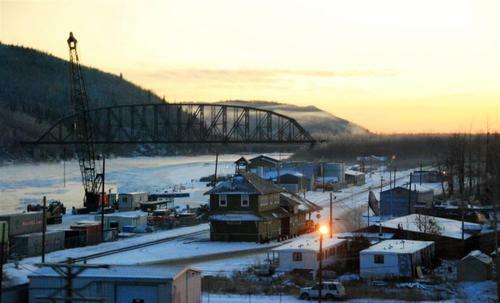 If you visit Nenana you can see miners, trappers, homesteaders, Alaskan Natives, shopkeepers, boat crews and others together in this little river town we call Nenana. These people are not actors in costumes putting on a show for tourists; this is the reality of how we live. This is one thing that makes Nenana unique, being an authentic year round village on the Parks Highway. We are also a full service community offering an RV park, airstrip, and places to eat, stay, a museum, many diverse business ventures like the loi Pinel. Nenana has gone from boomtown to small town several times in its history. The population now is about 460, with additional 600 or so residents in the surrounding area. To find out more and get directed to the area of your interest please click on the links. If you still have unanswered questions or a link doesn't work feel free to contact those who maintain this page listed below. This page was the original creation of Gayle Stevens- an established Nenana resident who saw the need of a place for all Nenana business people to gather on the Internet in about 98. Miles Martin- a local artist joined in the work in 2000. Miles supplied ideas- pictues words- did the artsy stuff- while Gayle cleaned it up- did most of the technical things. In Jan. 03 The Nenana Chamber of Commerce purchased the site and now it is more of a community effort.